This might be one of the extremely rare occasions where for various reasons, the movie is better than the book. And the book is plenty good (read my review here). I've never seen a movie theater as packed with kids during a school day as I saw today at the Grande in Greensboro for the 1:15 showing of The Hunger Games. There were six or seven girls in costume as Capitol citizens (including one as Effie, complete with shocking pink hair). It was nearly a sold-out show and the showings tonight were already sold out when I bought my ticket. The film adaptation takes a scarce few liberties with Suzanne Collins' megaselling novel. Those are so minor that you generally won't miss them (I was a bit let down that the muttations during the climax at the Cornucopia didn't resemble the deceased tributes). But the film also adds considerably more to the narrative that we didn't see in the book, particularly with Donald Sutherland's portrayal of President Snow: positivalutely one of the most menacing and chilling villains that I've seen in quite awhile. If you liked the book, you're going to love this. If you haven't read the book yet, I think you'll still get plenty of thrill out of The Hunger Games. It's a beautifully shot movie (filmed entirely here in North Carolina, with Charlotte playing the Capitol and the mountain area used for District 12 and the Arena) that brought to life the look and feel of Panem's despotic realm. 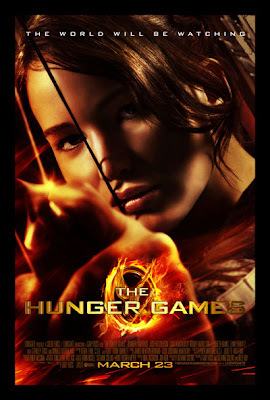 Jennifer Lawrence is spot-on perfect as Katniss: the girl who volunteers for the Games in place of her younger sister. I genuinely came to empathize with Lawrence's Katniss, and even knowing how the book ended I caught myself wrought with fright when the Hunger Games begin. From the getgo it is a brutal contest. Maybe even unsettling for some people. Children killing children with such savage relish isn't something that I like to think most audiences are used to. A very, very solid movie. One that treats its viewers with intelligence and respect. I'm looking forward to seeing it again this coming week. I'm pretty sure I'll be seeing it again before it's theatrical run is over. As you can tell on my blog (shameless self-promotion), I loved it too. Not perfect but one of the best film adaptations ever for a novel. You should have seen the midnight crowds on Opening Night. So many Effie Trinkets and girls with Katniss braids, LOL!